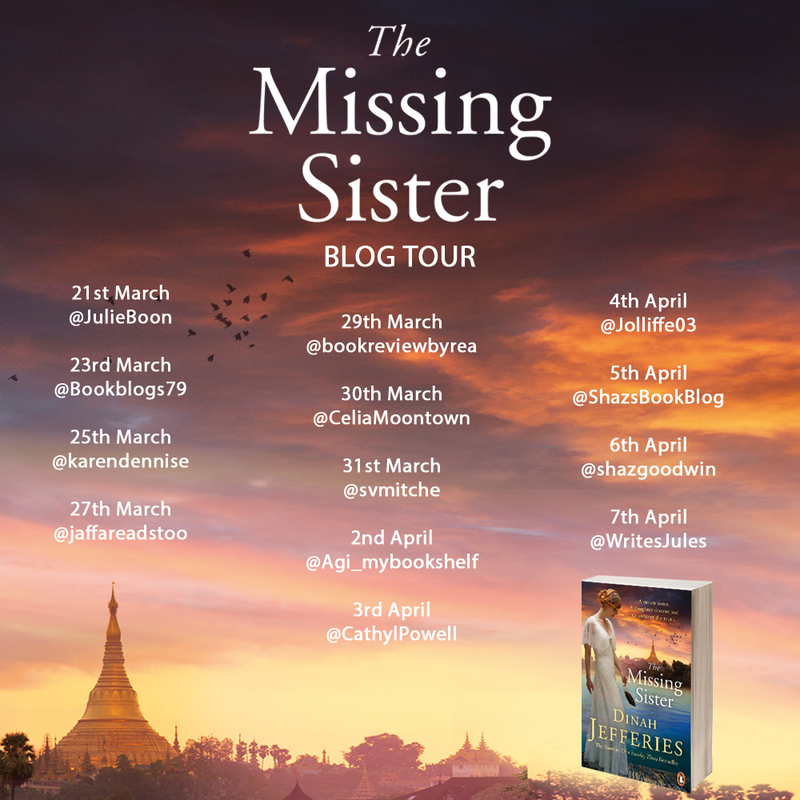 When I was asked to take part in the blog tour for Missing Sister by Dinah Jefferies I jumped at the chance because this is an incredible author whose books are pure perfection and I look forward to her new releases each year. When Belle’s father died she finds out she once had a sister who went missing at only a few weeks old when her parents lived in Rangoon. Desperate to try and find out the mystery surrounding her sister’s disappearance she accepts a job in Rangoon as a hotel singer to enable her a chance to discover any information that can help to find out more about the sister she never knew she had. It soon becomes apparent that there is more to the story in the press cuttings she found when she begins to receive anonymous threats as she begins her search. Dinah Jefferies has such an extraordinary way with words unlike any author I know, her ability to describe everything so vividly from the aromas to the settings means I have no need to use my imagination as everything has been pictured for me so precisely it is as though I am walking the streets with the author and our main character Belle soaking up the atmosphere along with them. Dinah Jefferies manages to capture not only the exotic beauty of Burma but she also shows a dark devastation both visually and emotionally with the effects of corruption and vengeance. Trust and hidden secrets are at the heart of this novel, not only does our main character Belle not know who she can trust around her but I had my guard up around every one of the supporting characters in this novel so I could feel the desperation and loneliness along with Belle. The chapters jump back and forth between the present with Belle in 1930’s and back to 1911-1921 with her mother Diane as we begin to piece the events that took place back to the little baby’s disappearance. As much as I loved our heroine Belle I actually found myself more drawn to Diana’s character and longed for her chapters to come to build a better picture of what occurred at the devastating time for this families life. My heart went out to Diana and I found her storyline highly emotive. The author has once again undertaken extensive research for this novel and this shows in her storyline without reading her author note in the book. The Missing Sister is another remarkable atmospheric novel that will keep you guessing the whole way through.